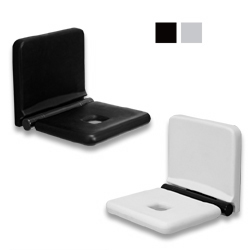 Fold down shower seat with integrated back rest, available black or grey. Sturdy, incredibly soft and comfortable single folding shower seats from our PUR line are made of an aluminum frame and covered with warm-to-the-touch polyurethane. When the seats are folded up they are not bulky in the shower enclosure, leaving more space for movement. 15"x 14"
Please call for current lead time. The Adaptive Living Store can not cancel, return or refund custom order items. Note: No fasteners included, manufacturer suggest to use fasteners suitable to wall characteristics on which the product will be installed. For additional help please contact an Adaptive Living Store representative toll free at 1-877-447-7816.